Today, I pay a visit to a supermarket near my house. I need to buy a little bit of mung bean because someone has taken away the mung beans that my sister grew it. I suspected that one of the children from the nursery beside my house "stole" it. 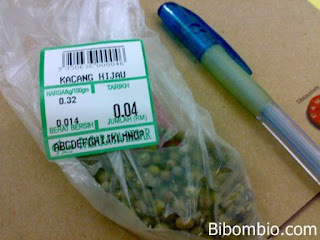 Because of government's new billing mechanisms, I am not allowed to take too little mung bean (less than RM 0.02). So, i took a little bit more and the price is RM 0.04. Yeah, I went to cashier. The sweet girl(i think is a young trainee) laugh(not smile), she is laughing with a low volume because she said this is the lowest transaction she have made! Well i am still surprise because she accept my 5 Sen coin that has some impurities on it. © Tay Kian Aik 2007-2012. Powered by Blogger.